IMCS short and long radius bends are designed for pneumatic conveying systems. Bends are available in a variety of wall thicknesses and centerline radius. 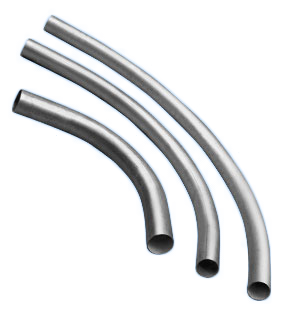 Bends can be fabricated in aluminum, stainless steel, carbon steel and galvanized steel. Bend sizes range from 1" O.D. through 12" IPS, Standard wall thickness for tubing - 16 gauge, 14 gauge and 11 gauge, Pipe - 5 gauge, 10 gauge and 40 gauge, other wall thickness available upon request. For high ware materials, call for pricing.